The problem with the thumbtack has everything to do with the thumb or thumbnail to be more precise. Using it to secure something on a soft board is not a problem. The problem lies in taking it out. 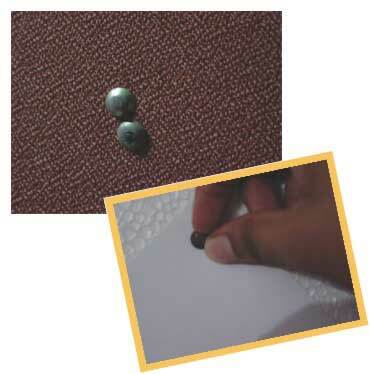 The thumbtacks once stuck to the soft boards or drawing boards can never be taken out easily as they do not have anything to hold and pull out. One always ends up hurting his or her finger tips or nails. Using nails to try out a fixed pin is not only painful but also dangerous as more often than not it is rusted. More often than not people use something else (keys for instance) which can be easily avoided by a little change in design. You may be trying to use the wrong item for the purpose you intend. The thumbtacks you have pictured are intended for use on hard surfaces (hence the wide smooth head for easier insertion) and are intended to be difficult to remove. The low profile along with the thin edge makes them ideal for posting on public boards where you don't want them stolen. These types of thumbtacks are indeed well designed for their purpose. For easy removeal, use a push-pin type tack. For reusability you push it at an angle to the surface rather than normal to it. So you always have sufficient space and leverage to pull it out without much effort.